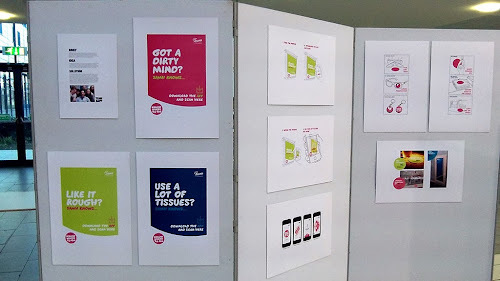 Our 'One Week Agency' teams presented their work in the studio today to the client, SAMH. Also in attendance were mentors Graham Neish, Alan Lennon and Veronica Ferguson. Each team pitched a great concept with plenty of ideas - some safe, some radical - and the client will now have to go away and make some tough decisions. Jo Anderson, SAMH's Director of External Affairs & Fundraising, said "We were blown away by the amount the students have achieved in a single week. The pitches felt really professional, and the creative is really strong in all the solutions, so we've got a difficult task now to pick a winner". Once the client has made a decision, we'll post the full presentations, plus some nice photos (by our resident photographer Derek Anderson), documenting the week and the presentations. You can find out more about this project here. 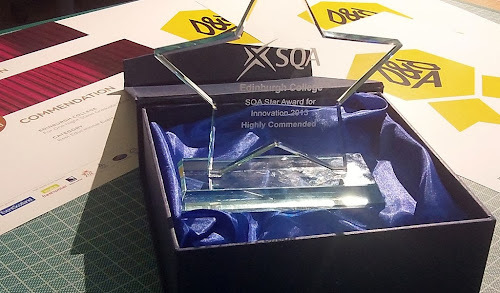 With our students busy on the One Week project, we've found some time to celebrate picking up a 'Highly Commended' last week at the 2013 SQA Star Awards. The Awards recognise inspirational achievements and commitment from individuals, schools, colleges and organisations across Scotland, and our nomination came in the Innovation category. This was for our Mentoring Programme, a sector-leading example of employer engagement in Further and Higher Education. The programme, now in its sixth year, has been hugely successful in helping prepare our students for a career in the creative industries, and this award recognises the exceptional commitment, energy and enthusiasm our mentors bring to the scheme. The Ceremony, held on Friday 8th at Glasgow Clyde College, was hosted by media personality Kaye Adams, and Design tutor Helena Good, along with Edinburgh College Vice-Principal Ray McGowan and Ian Kirkby (Design Director, Lewis) attended the event. 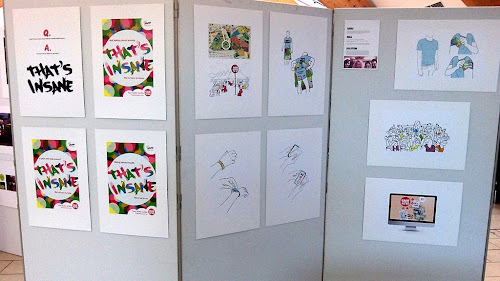 This has been an exceptional year for the HND Graphics course. 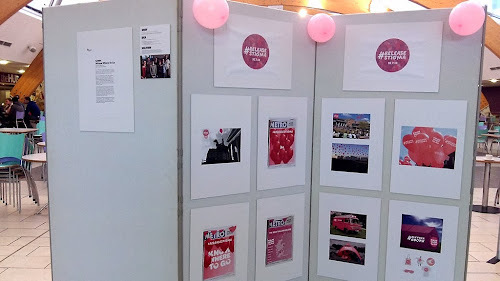 As well as our students winning numerous awards - a D&AD Best-of-Year, 3 YCN Commendations, and Star Creative at the Scottish Marketing Society - the teaching team have picked up a Commendation at the Scottish Event Awards (for our One Night Stand graduate show), and now an SQA Star. Later this month we have a chance to add to this haul - we've been shortlisted at the College Development Network Awards for our induction programme. 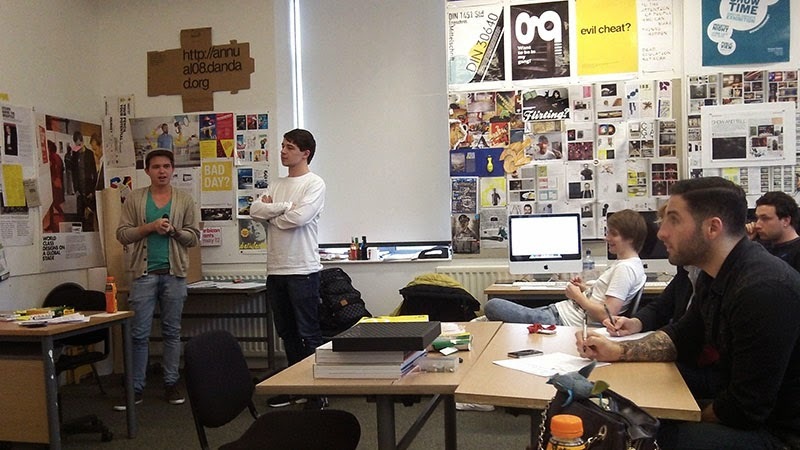 This curricular initiative sits alongside the Mentoring Programme and allows design students at NC, HNC and HND to collaborate on a single project at the start of their academic session. The CDN event takes place on Nov 28th at the Radison Blu in Glasgow, and tutors Alex Gunn and Chris Hughes will be attending along with mentor Alan Lennon (Creative Director at Lennon Design). 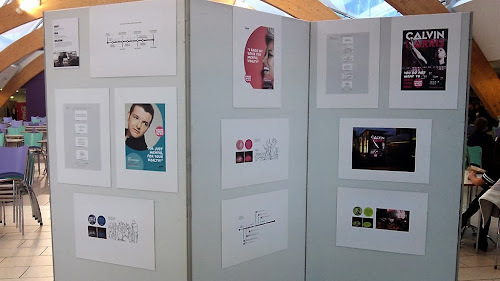 We've been busy this week organising our 'One Week Agency' project. This is the third year we've set a project in this format, where our design students are split into small agency teams to work on a live client brief, alongside an industry mentor. Tutor involvement is minimal and the teams are essentially autonomous 9-to-5 for the whole week. We've expanded the project from last year, assembling six teams of six students by combining the HND and HNC classes. We also have a great roster of industry collaborators, including mentors Graham Neish (Neish), Kirsten Murray (Family), Alan Lennon (Lennon), Jen Wood (RAPP), and a quartet from Lewis, comprising Ian Kirkby, Gregor Matheson, Gill Carrie, Michael Heins. 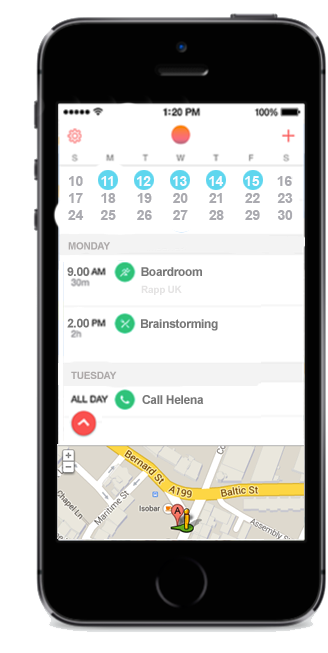 To accommodate the teams we've secured an impressive set of team locations - three in-house at the Granton campus, two at the Creative Exchange in Leith, and one at the RAPP Agency. This time around the work is for SAMH (Scottish Association for Mental Health), Scotland’s leading mental health charity (www.samh.org.uk). SAMH's Lexi Parfitt (Campaigns Officer) and Rebecca Sibbett (External Comms) were in our studio today to present the creative brief to our teams. They highlighted recent research conducted by YouGov showing that 45% of people in the 18-25 age bracket said they wouldn’t know where to go to get help with a mental health problem. The challenge therefore is to use any channel of communication to enable young people in Scotland to get help for mental health problems when they need it. 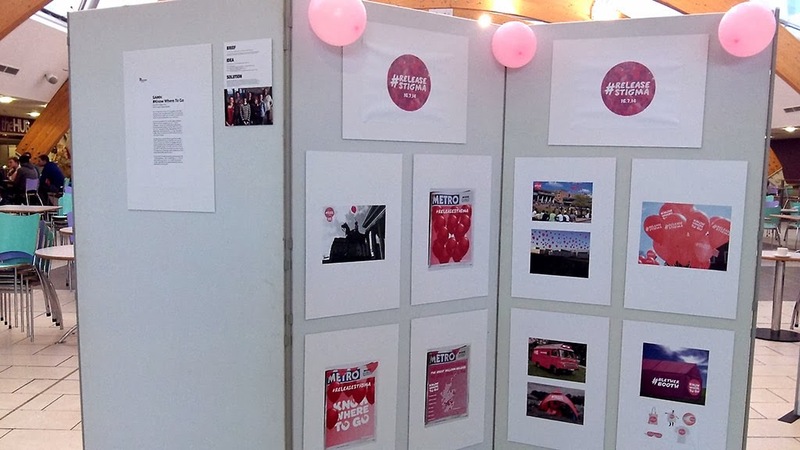 SAMH's current campaign to raise awareness is called ‘Know Where to Go’ and this idea is a key creative parameter the teams need to work within. 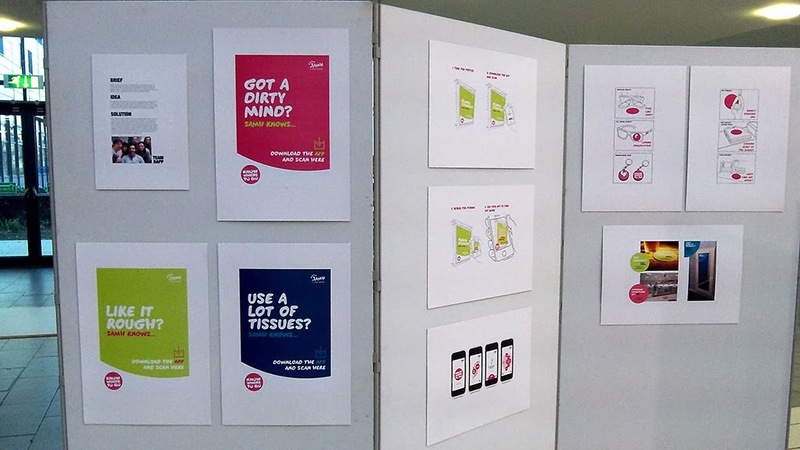 They also need to use the SAMH logo and brand guidelines, which incidentally have recently been re-designed by one of our favourite agencies, Heedi, whose Creative Director Veronica Ferguson is one of our longest-serving mentors. 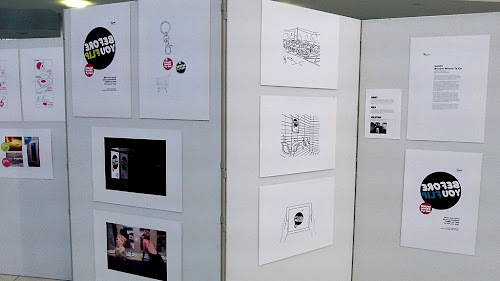 We'll be documenting each stage of the process with the six groups, and the presentations for the project will take place on Nov 21st in studio R310 at Granton Campus. Then it's over to the client to make their decision! One Week Agency #3 runs from 11th-15th November. Last week we had one of our new mentors, Gregor Matheson, Digital Designer at Lewis, in the studio to do a guerilla day project. Gregor set a brief to promote the positive use of swearing - without actually swearing. 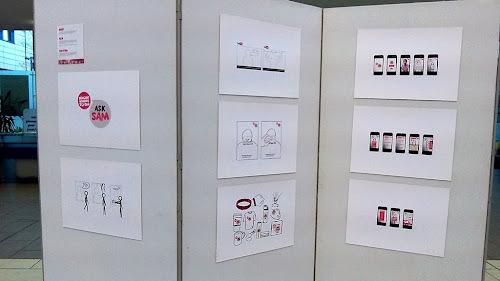 The class were put into pairs and their presentations had to include their thought process after receiving the brief, a short rationale behind the concept, and the final outcome. Some of the samples will soon be making their way to our pinterest boards, and it looked like a lot of fun.